Revenue Management Follies--Method or Madness? Can anyone top this? Hell, anyone want to take a crack at explaining it? I can explain it. I’m presuming that would be Saturday February 23, which is the Saturday after Presidents’ Day. Lots of pacific NW school districts get the whole week off, and people start funneling back from their Mexico beach vacations via lax on Saturday night. Sunday can often be even worse. Check the lax to sea flights that day and it looks similar. This same pricing phenomenon happens during the rolling spring break in late March and early April. It’s not a fare mistake, sadly. Obviously they think that they will sell enough Y to make it worth their while. I don't think that's how it works. Each published X fare has an underlying booking code. In order to ticket it you need both the X and the underlying booking code. Theoretically they could publish an X fare for Y but they don't. Thank goodness for small miracles! There are hundreds if not thousands of these threads published about AS and every other air carrier in the world. They all revolve around a central theme, e.g. 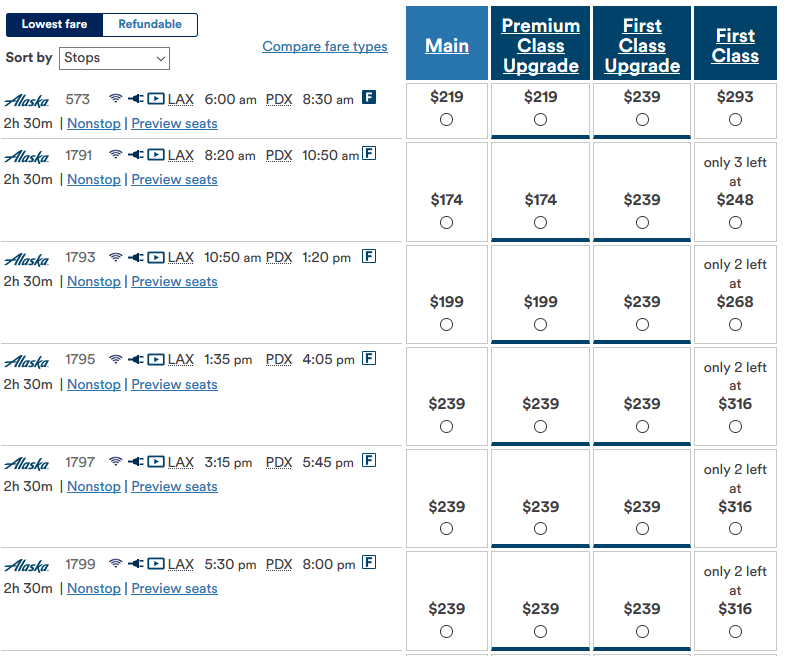 that the air carrier is nuts to sell Ticket X for $Y. The post then accuses the carrier of "gouging" for charging what a purely market-driven system sets the price at. It's not gouging. AS has multi-million dollar software to set RM/IM and therefore pricing based on hundreds of factors. None of us have that. Could be some of the reasons from above and could be something else. Bottom line is that February is a long way off and if AS has any reasonable belief that someone will pay the asking price that far away, why on earth sell it for less. If it turns out that AS can't sell at that price, it will sell into a lower fare bucket. Also, don't forget that many people flying this route are connecting at LAX so they are not buying the segment fare you are looking at. For you it's a crap shoot. Could be that the price drops or could be that the flight sells out. They go pretty high up the ladder though. For that route, it looks like Q is the lowest code that is not an underlying code for any X fare. jerry a. laska likes this. The other day I was hunting for a LAX-SEA flight and everything was ~$70 the whole day EXCEPT for the horrible redeye (midnight-3a) which was only available in full Y. I fly that terrible flight somewhat frequently and many times I'm the only one who isn't an AS employee heading home. So RM does weird stuff sometimes. All times are GMT -6. The time now is 6:47 pm.